Of all the symbols of a permanent relationship the wedding rings are the most personal. Choosing the perfect engagement ring is the first major decision. Then the wedding bands follow. After all these will be offered as a pledge of undying love and will be worn on the ring finger of your left hand for the rest of your lives. A trip to the perfect jeweler will result in the unique and personal tokens that you will wear for life. I recall the couple who’s hands these rings belonged to. It was a wedding I shot many years ago. 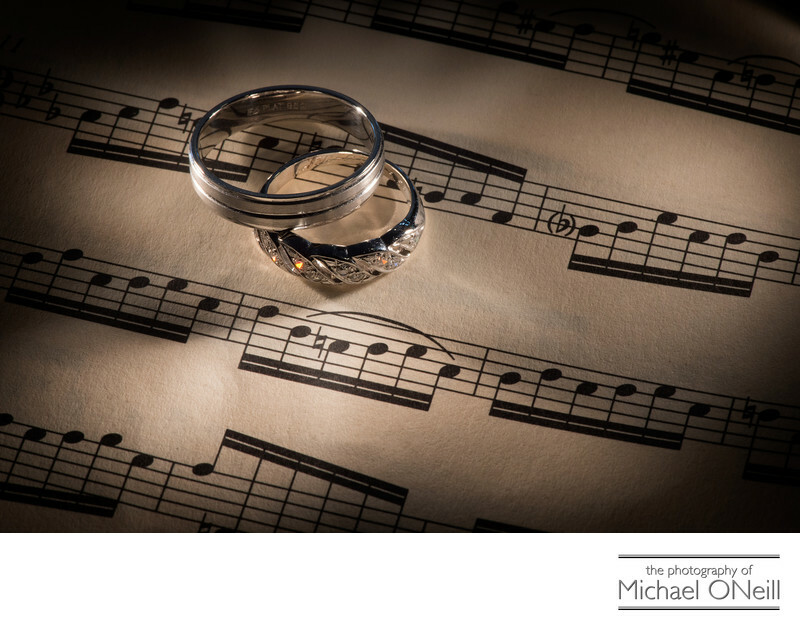 The bride and the groom were both accomplished musicians and when I got to the bride’s house for her preparations with her bridal attendants I asked for a piece of sheet music along with the wedding invitation that I always photograph the rings with. Of course they chose this image to put in their custom bound wedding album. At their wedding reception the couple actually sang to each other and I’m sure they are still making beautiful music together.